Notes: Classical showcase event to launch FACT 316 / 326 / 336 / 346 / 356 at London's Bloomsbury Theatre. 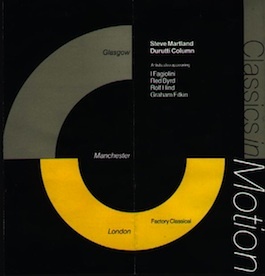 There are a 'Classics in Motion' T-shirt (in grey), a poster and a leaflet; all with related graphics and "FAC 318" on them. Originally allocated to the London 'Classics in Motion' concert.